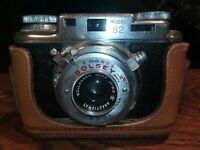 Vintage ARGUS C3 35mm Rangefinder Camera "The Brick"
dfontec7g7a has no other items for sale. Details about ARGUS C3 rangefinder 35mm film camera 50mm lens case COLLECTIBLE "THE BRICK"
ARGUS C3 rangefinder 35mm film camera 50mm lens case COLLECTIBLE "THE BRICK"
Email me after the auction for shipping arrangements. You must send payment in 5 days.